It's always better to buy fruits and vegetables in season. That's when they have the best flavor, and when prices are fairest. You will find these fruits and vegetables in the market in spring. Note that specific crops and harvest dates depend on the climate of your region (see regional and state-specific seasonality guides for details). Apricots come into season towards the end of spring in the warmer areas where they grow. Artichokes have a second crop in the fall, but the main harvest takes place in the spring when the largest thistles are available. 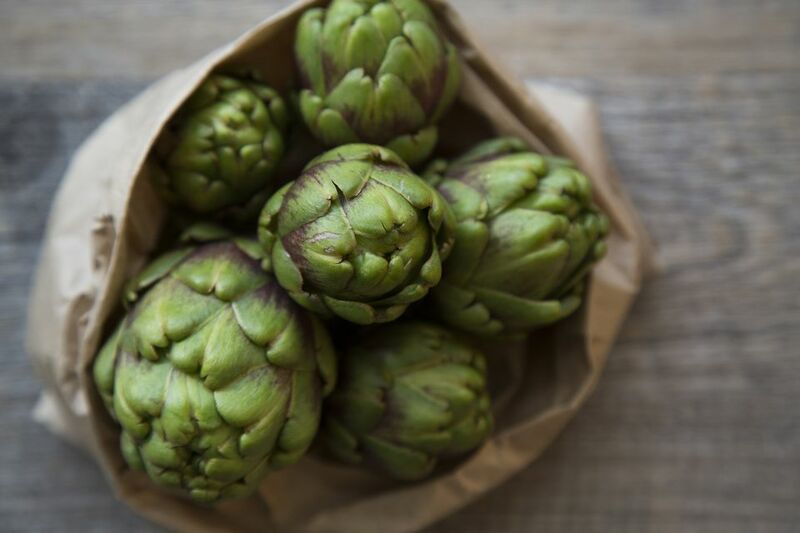 Look for artichokes with tight, compact leaves and fresh-cut stem ends. Arugula (aka "rocket") is a cool-weather crop. Long days and warm weather make it bolt, or flower, and bring an unpleasantly bitter flavor to the leaves. Wild arugula is foraged in spring and again the fall. Cultivated arugula is grown year-round, thanks to coastal, temperate growing areas and winter greenhouses. Asparagus is harvested from March through June, depending on your region. Note that thickness in no way indicates tenderness, which is related to how the plant is grown and how soon it is eaten after harvest rather than spear size. Beets are in season in temperate climates fall through spring, and available from storage most of the year everywhere else. Fresh beets are often sold with their greens still attached. Cardoons taste a lot like artichokes; look for firm, heavy-feeling specimens. Carrots are harvested year-round in temperate areas. True baby carrots—not the milled down versions of regular carrots sold as "baby carrots" at grocery stores, but the immature carrots farmers pull from fields to thin the rows—are available in spring and early summer. Chard grows year-round in temperate areas and is best harvested in late summer or early fall in colder areas, and fall through spring in warmer regions. Like all cooking greens, chard turns bitter when the weather gets too hot. Cherries are ready to harvest at the end of spring in warmer areas. Sweet cherries, including the popular Bing and Rainier varieties, are available from May to August. Sour cherries have a much shorter season and can be found for a week or two, usually during the middle of June in warmer areas and as late as July and August in colder regions. Dandelion Greens are a Mediterranean favorite available in the U.S. from early spring through summer. Fava Beans are another Mediterranean favorite with a growing fan base in the United States. Look for favas at markets starting in the spring and through the summer in cooler climates. Fennel's season comes to an end in temperate areas and just gets going in cooler climates. Fiddleheads are available in early spring through early summer depending on the region; these young wild ferns are found by foraging. Garlic Scapes/Green Garlic are both available in spring and early summer. Green garlic is immature garlic and looks like a slightly overgrown scallion. Garlic scapes are the curled flower stalks of hard-necked garlic varieties grown in colder climates. Grapefruit from California, Texas, Florida, and Arizona comes into season in January and stays sweet and juicy into early summer. Herbs are cultivated year-round in temperate climates and come into harvest in the spring in warmer areas. Kale of all sorts comes into season in warmer regions. Kiwis grow on vines and are harvested winter through spring in warmer and temperate areas. Kohlrabi is harvested in the fall in cooler areas, and through early spring in more temperate areas. Kumquats come into season in late winter and are still available in very early spring. Leeks more than about 1 1/2 inches wide tend to have tough inner cores. The top green leaves should look fresh—avoid leeks with wilted tops. Lemons are at their juicy best from winter into early summer. Lettuce starts coming into season in cooler climates (it grows through the winter in temperate and warmer areas). Morels are found by foraging in the wild in the spring. Look for firm specimens at specialty markets and foragers' stalls at farmers markets. Nettles are sold at markets by foragers and farmers, but most people get theirs the old-fashioned way: foraging for them themselves. If you're lucky they're growing as "weeds" in your garden. New Potatoes are small, freshly harvested potatoes with paper-thin skins. They are delicious simply boiled and buttered or used in potato salad. Parsley may seem to be season-less, but this cool-weather herb flourishes in the spring in warm and temperate climes. Pea Greens are sold in big tumbled masses in spring and early summer. Look for bright vines with fresh, vibrant looking leaves. Avoid vines with brown or mushy ends or damaged leaves. Peas (garden, snap, snow, etc.) come into season in the spring and continue in most areas well into summer. Radishes are at their sweet, crunchy best in the spring. Ramps are found by foraging in the spring and early summer and sometimes available at farmers markets and specialty stores. Rhubarb is the first fruit of spring in many areas—look for heavy stalks with shiny skin. Spinach season varies with climates—it's available year-round in temperate areas, in summer and fall in cooler areas, and in fall through spring in warmer regions. Spring Onions are simply regular onions that farmers pull from the field to thin the rows in spring and early summer. Strawberries are mostly grown in California or Florida, where the strawberry growing season runs from January through November. Peak season is April through June. Other areas of the country have shorter growing seasons that range from five months to as short as a few weeks in the coldest areas. Turnips have a sharp but bright and sweet flavor. Look for turnips that feel heavy for their size and, ideally, with fresh, vibrant greens still attached. See What's In Season In Alabama!